There are three Super Bowl guarantees: lots of food, a fancy half-time show, and Tom Brady repeatedly making you ask yourself how he does it. Which is all well and good, unless you’re on a ketogenic diet. Is there such a thing as a keto Super Bowl party? Mr. Brady and most Super Bowl snacks don’t give a care when it comes to keto diet foods. Super Bowl Sunday can bring out the carbs like nobody’s business: chips, burger buns, sugary pulled pork, and pizzas can easily pile up along the buffet. But don’t worry—we’ve got you covered. There are a ton of keto diet recipes for Super Bowl parties that can keep you on track, and we’ve compiled a handful of them. Many will likely draw from your current keto diet food list of low-carbohydrate foods, so they will be easy to follow. And because of the great flavors these foods supply, it’s likely your friends will gobble up your keto snacks—so be sure to make extra! If you want to keep it keto this Super Bowl Sunday, here are some low-carb recipes for you and your friends to pick at during the game. Slit each pepper open, lengthwise, and remove the seeds and ribs. Do your best to keep the shape of the pepper intact. With a fork, mash the cream cheese and cheddar together in a small bowl. When thoroughly mixed, stuff the cheese into each pepper. Close the pepper as much as possible and wrap a slice of bacon around it, using a toothpick to secure (if necessary). Lightly coat each popper with avocado oil and arrange on a large baking sheet. Cook until the bacon is crispy, roughly 20 minutes. Broil for a couple of minutes if further browning is desired. *You can use store-bought avocado mayo if you don’t want to make your own. **All optional for some added spice! Boil your eggs for eight to nine minutes, and place in cold water to cool. Add mayo, avocado, lime juice, and taco seasoning to the yolk bowl. Mash until it’s smooth. Add additional spices if desired. Mix half of the tomatoes and half of the bacon bits into the yolk blend, then stuff the mixture into the egg white halves. Top with the rest of the tomato and bacon bits. Pat the wings dry, then spread out in a single layer over paper towels and sprinkle with salt. Cover with a second layer of towels and allow to sit for 20 minutes. Place one oven rack in the middle-lower position and another in the upper-middle position. Preheat the oven to 250 degrees F and set a baking sheet aside. Place the wings and the baking powder in a resealable plastic bag and shake until the wings are evenly coated. Raise the oven temperature to 425 degrees F and transfer the baking sheet to the upper-middle oven rack. Bake the wings for another 45 minutes. Meanwhile, combine the melted butter, Parmesan cheese, minced garlic, parsley, garlic powder, onion powder, and pepper in a medium-sized bowl. Mix into a sauce. Remove the wings from oven and allow to rest for five minutes. Toss them in the sauce and serve hot. Use a sharp knife to carefully cut the cauliflower head into small florets. Combine olive oil, garlic powder, salt, and pepper in a large bowl. Add the florets and coat them evenly. As the cauliflower cooks, combine the hot sauce, butter and lime. Stir. For the blue cheese dip, melt two ounces of blue cheese in a small bowl, then add the Greek yogurt and mix well. Add the lemon juice, salt, milk, and chopped parsley and mix until completely blended. For texture, crumble in an additional ounce of blue cheese, gently mixing into the sauce so crumbles remain intact. Add salt and pepper to taste. Toss the baked cauliflower with the Buffalo sauce and garnish with two more ounces of blue cheese and some chopped parsley. Serve with blue cheese sauce on the side. Cook chopped onion for five to seven minutes in a pan over medium-high heat. Add in the minced garlic and cook for about a minute. Add the ground beef and cook for eight to 10 minutes, separating with a spatula, until browned. Pour the meat mixture into the slow cooker/Crock-Pot. Add remaining ingredients, except for the bay leaf, and stir until combined. Place bay leaf in the middle. Cook for six to eight hours on low, or for three to four hours on high. Remove the bay leaf before serving. Select the “sauté” setting and add chopped onion when hot. Cook for five to seven minutes, until translucent. Add garlic and cook for about a minute. Add ground beef and brown, cooking for eight to 10 minutes. Separate with a spatula. Add the rest of the ingredients, except for the bay leaf, and an extra cup of water. Stir until combined. Place the bay leaf in the pot. “Cancel” the sauté setting and close the lid of the pot. Press “meat/stew” and set cook time for 35 minutes. Allow the Instant Pot to naturally release and remove bay leaf before serving. You don’t have to politely decline all the mouth-watering Super Bowl snacks this Sunday. Kick off your party right with any (or all!) of these delicious keto Super Bowl appetizers. Gorsky, F., “Keto Cheese-Stuffed Bacon Wrapped Jalapeño Poppers,” The Keto Queens, December 29, 2017; https://theketoqueens.com/keto-jalapeno-poppers/, last accessed January 28, 2019. Maya, “Mexican Keto Deviled Eggs Recipe with Avocado and Bacon,” Wholesome Yum, May 5, 2018; https://www.wholesomeyum.com/mexican-keto-deviled-eggs-recipe-with-avocado-and-bacon/, last accessed January 28, 2019. 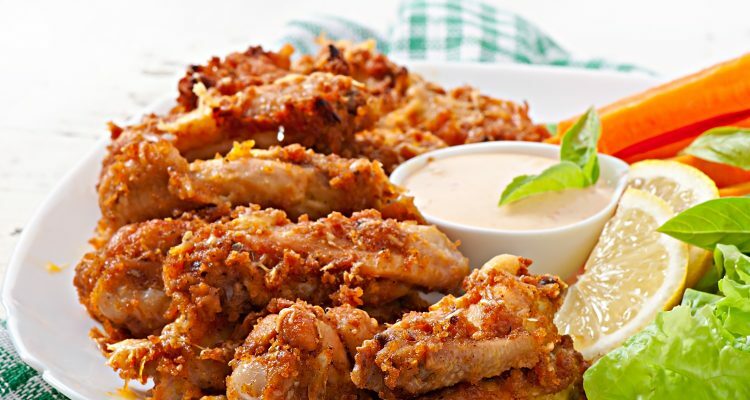 Holley, K., “Keto Crispy Baked Garlic Parmesan Wings,” Peace, Love & Low Carb, February 18, 2018; https://peaceloveandlowcarb.com/crispy-baked-garlic-parmesan-wings/, last accessed January 28, 2019. Holly, “Roasted Buffalo Cauliflower with Blue Cheese Sauce Recipe,” Taste and See, 2019; https://tasteandsee.com/roasted-buffalo-cauliflower-with-blue-cheese-sauce-recipe/, last accessed January 28, 2019. Maya, “Keto Low-Carb Chilli Recipe,” Wholesome Yum, January 25, 2017; https://www.wholesomeyum.com/recipes/low-carb-chili-in-crock-pot-or-instant-pot-paleo-gluten-free/, last accessed January 28, 2019.